As the capital of rural Western Victoria, Horsham is only a short drive from most of the region’s premier attractions. 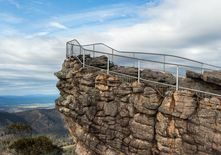 This includes the Grampians region, home to an array of activities such as the Halls Gap Zoo, various walking trails for all abilities, and gourmet wine and food. Dadswells Bridge, home of the Big Koala, is also a short journey down the highway. The region is also host to an abundance of events throughout the year, including the Wimmera Machinery Field Days, the Grampians Grape Escape Wine and Food Festival, the Stawell Easter Gift, the Natimuk Frinj, Spring Garden Festival, and the Country Music Festival. Halls Gap Wildlife Park & ZooHalls Gap Zoo in the Grampians, Victoria, Australia. Situated at the foothills of the majestic Grampians mountain ranges, the Halls Gap Zoo comprises 160 species of native & exotic mammals, reptiles and birds.